Heaviest Fish in a competition - Ian Russell - 10 lb 03½ oz. Heaviest Fish out of competition - Dave Perrett - 7 lb 06 oz - The new Sandsend Trophy. 1st - Andrew Spilman - 23 lb 00 oz. 2nd - Mark Braim - 10 lb 10 oz. Whitby Sea Anglers Association held their annual dinner at the Giardini Grill, Roxby, with 51 present. The chairman, Mr W Atkinson, reported a good season. More fish were landed and more members joined. Sprats were not in evidence so anglers had a much better season. But the size of fish caught was smaller - in the 1 lb to 3 lb range. Mr Atkinson also thanked Mr J Metcalfe for donating the Sandsend Trophy. Secretary Mr A Barningham echoed the chairman's remarks, and said the winning aggregate weight of 117 lb 02 oz was 37 lb higher than that returned by the previous year's winner. Mr Barningham added the Association now had 49 members. An average of 21 members fished in over 40 matches. It was good to see an influx of younger members. 7 - A Humble Trophy, D Thompson - 60 lb 08 oz. Heaviest fish and F Kirk - I Russell - 10 lb 03½ oz. The new Sandsend Trophy was won by D Perrett with the heaviest fish caught by a club member out of club competitions. It weighed 7 lb 06 oz. 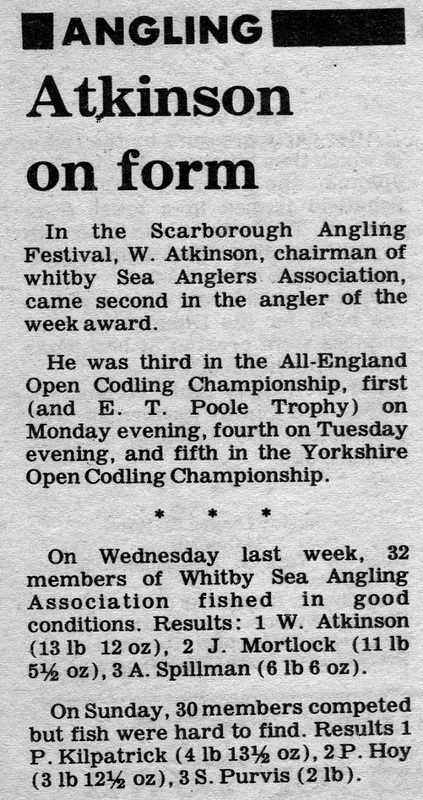 In the Scarborough Angling Festival, W Atkinson, chairman of Whitby Sea Anglers Association, came second in the angler of the week award. He was third in the All-England Open Codling Championship, first (and E T Poole Trophy) on monday evening, fourth on Tuesday evening, and fifth in the Yorkshire Open Codling Championship. 3 - A Spilman - 6 lb 06 oz. 3 - S Purvis - 2 lb. 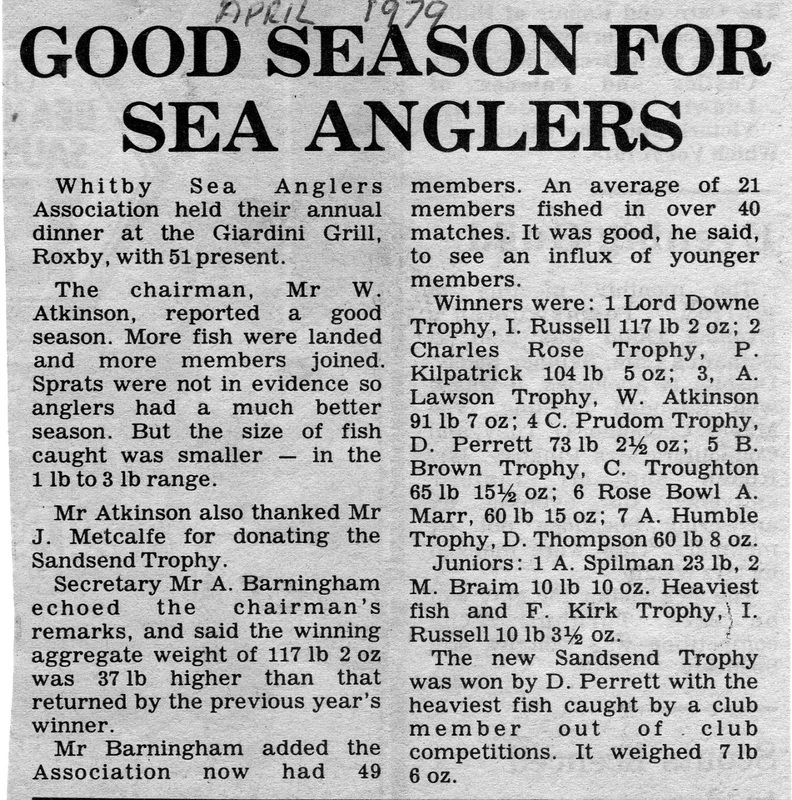 1979 - Courtesy of William Atkinson, Chairman of Whitby Sea Anglers Association, from his personal collection of press cuttings. Thanks also to the Whitby Gazette. Posted 18/02/2013 PDH. October - 25 lb 09 oz. November - 26 lb 09½ oz. December - 15 lb 06 oz. January - 14 lb 14 oz. February - 5 lb 06 oz. March - 3 lb 10 oz. Total weigh-in 91 lb 06½ oz.